Posted on March 15, 2015 March 15, 2015 . by Patrick Johnstone. Leave a comment. The Canadian Taxpayers Federation have always been reluctant to talk about where their money comes from, but as the front organization for Federal Conservative datamining the NO side in the ongoing Metro Vancouver Transportation and Transit Plebiscite, they attempted to get some press this week by releasing a declaration of their campaign contributions. Except, of course, they did no such thing. Their declaration document, which you can read in its entirety here, is amazingly bereft of details, and suffers from some basic math problems (reinforcing the notion that math is not a CTF strong point). The document states that the NO campaign has a budget of $27,259.30. 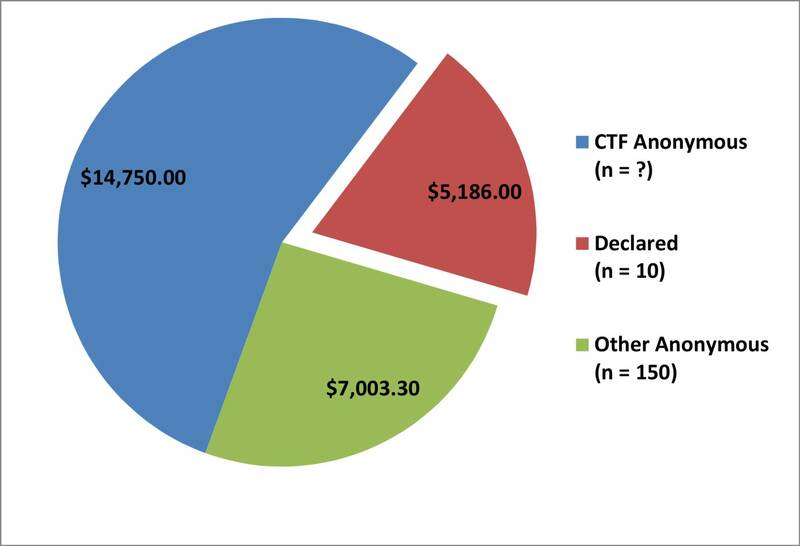 That came from anonymous donations amounting to $7,003.30, declared donations from 10 individuals that total $5,186, and $14,750 from the CTF coffers. Those numbers leave an unexplained $320 gap, but that is not the real problem with this “declaration”. Of the $27,259.30, exactly $5,186 is actually disclosed – less than 20% of the total money they are spending is from a declared source. The largest contribution, the $14K from the CTF itself, will never be declared, nor is it clear if this declaration actually covers the true cost of this campaign – not the least including what portion of Jordan Bateman’s $75,000 annual sticking-up-for-the-little-guy salary is included, or how much Hamish Marshall is getting paid, because he doesn’t seem like the kind of guy who works for free. 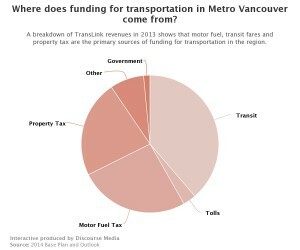 “Declared” donations to the NoTranslinkTax campaign by category. More concerning, the 160 (or 153, as the CTF doesn’t even get the number of donators correct) people donating to the campaign, they list 10 people, or 6%. How is that “Releasing a Donor’s List?” And , of course, that 160 (153?) people does not include the mysterious people who pump up the CTF tires every day. The CTF, with this half-hearted and untruthful declaration is in no position to criticize the Better Transit and Transportation Coalition, which is comprised of (at last count) more than 130 member organizations, all listed on the website. It is clear that the Mayor’s Council is spending money on this campaign, and each City that contributes is going to need to account for how that money is being spent (for example, New Westminster set a budget of $20,000, and is within that budget). 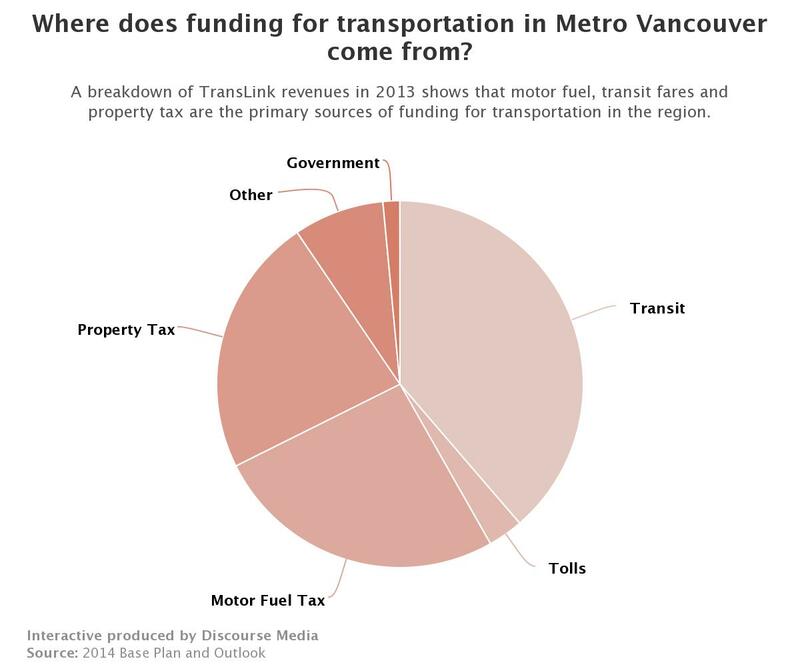 It is also clear that TransLink took some of the money they regularly spend on advertising every year (a little under 1% of their budget) in order to get the word out about the Plan. That is public money and will be declared publicly, as is the law for these types of organizations. However most of the partners in the coalition, from the David Suzuki Foundation to the Vancouver Board of Trade and Unifor all have their own accounting requirements, and will need to declare to their members how their money is being spent. The CTF will need to do this as well, but no-one expects that to be a public declaration, and besides a few board members and spokespeople, no-one is really sure who their members actually are. So I’m not criticizing the CTF for not being open about their spending, I’m criticizing them for pretending to be open and daring anyone else to pretend to be as open as them. Yet another silly distraction. The Future of the Region – Yes or No. Posted on March 7, 2015 . by Patrick Johnstone. Leave a comment. A few interesting developments on the Referendum front, and it has been a while since I wrote about it. Unless you have been living under a rock, or work in a phone bank for the BC Liberal party*, you are aware there is a referendum going on to decide how we will invest in transportation in the region. If you were born before May 30, 1997, have been a resident of BC since November 29, 2014, are a Canadian resident and live in Metro Vancouver, you can register to vote online at the Elections BC website or call their 1-800 number (you need a Driver’s Licence or a Social Insurance Number). You will get a ballot in the mail. If you don’t get a ballot in the mail in March, you should contact Elections BC and request one. You have until March 29 to return your ballot. 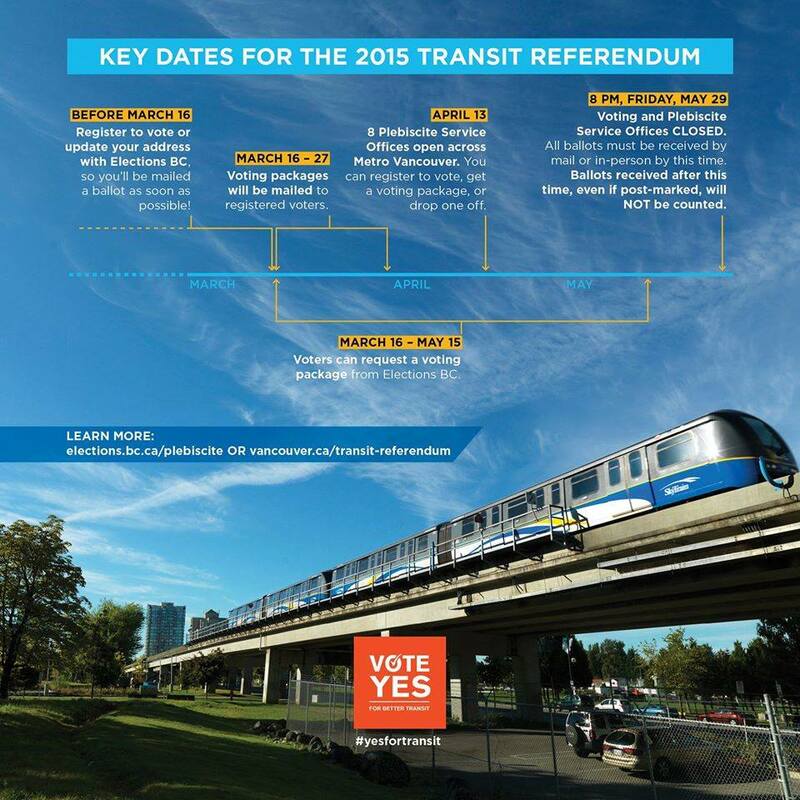 The Mayor’s Council set up this helpful graphic to show you the timelines of the vote. Like my council Colleagues across the region, I have been busy with this campaign. As unique as the voting mechanism is, this is just an election campaign, and identifying your vote and getting it out requires a lot of organization. I have been talking to community groups, helping with phone volunteers to identify support bases, and helping develop the get-out-the-vote plan, etc. etc. I’ve said before that democracy is not what happens on election day, but how we, as citizens, get involved between elections to get the most out of our elected representatives. If you think this referendum needs to be won, if you think we need to put the brakes on the cuts to transit service and enter a new era of transit expansion in our region, then I ask you – what are you doing about it? Get in touch with me, with the City of New Westminster, or the Mayor’s Council to see how you can help. 2: Hit back aggressively at specific mistruths being propagated by a few very prominent members of the NO side. One thing that always gives me a chuckle is the plethora of advice for how the YES side should be campaigning, mostly delivered by people loosely connected to the no side (for example, the wife of the guy who is coordinating the NO campaign for the CTF) and wrapped in sanctimony. We have been told, at times, to stop using scare mongering and stick to the facts; that we can’t rely on facts but should instead go for emotion; that we need to describe the plan in detail so people understand; that we need to simplify the message; that we need to appeal to “Joe Sixpack”, or “Students”, or that we should stop relying on “special interest groups”. Vote Yes. For nothing less than the future of the region as we know it. *I received a phone call from a BC Liberal**** fundraiser on Wednesday evening. I allowed him to go through his script about balanced budgets and good times ahead before I asked him what the party was doing to encourage support for the Referendum that the Leader had called, and was (tacitly) supporting. The poor guy had not even heard that there was a referendum going on. He claimed to be in Burnaby (and I have no reason to doubt him, as he seemed to understand what TransLink was and claimed to watch Global News, so he wasn’t in Topeka or Bangalore). I made what I think was a compelling case for the reasons to support the Yes side, and he asked if the result of the referendum would be a deciding factor in the next election for me. I said no, but the leadership shown during the referendum definitely was. He thanked me for my time, and actually forgot to ask for money. **Yes, this is a Plebiscite, not a Referendum. The differences are rather arcane. In most jurisdictions, the words are synonymous. In BC, they both mean “a vote on matter of public concern”. Where a Referendum is governed by the Referendum Act and “is usually binding on the government”, a Plebiscite is governed by the Elections Act and “may be binding on the government”. Remarkably, this vote is not being regulated by either, but by something called the “South Coast British Columbia Transportation Authority Funding Referenda Act”. Regardless, the Provincial Government changed the language from referendum to a plebiscite when the ballot was released, you can make up your own reasons why. Safe to say, whatever it is called, the results of this vote will be politically binding on the government, if not legally binding. ***Note the book at 1:03 in the video. None other than Charles Montgomery’s The Happy City. Nice touch. **** Since I wrote that footnote*****, I have noticed that some of the strongest messages coming out on the YES side are coming from BC Liberal MLAs, so I am glad to give kudos to the members of the party who are seeing the importance of this vote, and are putting their political capital into it. We need more of this in the next month. ***** This footnote thing is getting out of hand.